The versatility of the Stooges concept is aptly demonstrated by this disc. No matter what historic milieu, the notion of three morons who get themselves in trouble is always plausible and always funny. This disc features five two-reel shorts, three with Shemp and two with Curly, set in centuries past. Squareheads of the Round Table (1948) finds the boys portraying medieval troubadors. Their friend Cedric the Blacksmith (Jacques O'Mahoney) is in love with the Princess Elaine (Christine McIntyre), who is engaged to the evil Black Prince (Phil Van Zandt). The boys attempt a serenade to win her heart and the results are violent and funny. Fourteen conks to the head and an even dozen slaps. The clock turns much, much farther back in I'm a Monkey's Uncle (1948), as Larry, Moe, and Shemp are cavemen who have made the mistake of stealing the girlfriends of a neighboring tribe. There's a lot of silly mucking around in water for Moe, but the finale combat works very well. Precious liittle violence, with only a single eyepoke, seven blows to the head and a pair of slaps. The boys are hidden nobility in Restless Knights (1948) as Curly stars as Baron of Graymatter. They must foil a plot to kill Queen Anne of Anesthesia. What's otherwise an early classic (it was only the sixth Stooges short filmed) is brought down a bit by a lengthy wrestling sequence that goes nowhere. Walter Brennan is featured in an uncredited role (and heavy makeup) as their aged dying father at the beginning. A full 17 conks on the noggin and 8 slaps keep the violence quotient up. Curly is prominently featured in Roman times in Matri-Phony (1942). Frequent foil Vernon Dent is lecherous emperor Octopus Grabus, and his decree is that all redheads between 18 and 22 must come to the palace for matrimonial purposes. Young Diana (Marjorie Deanne) hides out in the Stooges pottery shop and as they attempt to save her from the Emperor's clutches the only answer is to put Curly in drag and send him in her stead. The play between Dent and Curly is hilarious and one of the funniest bits on the disc. Only six thumps to the egg and three slaps for a fairly mild Curly outing. Fiddlers Three (1948) was not only shot back to back after Squareheads of the Round Table, but many of the sets are used again here. This time out Dent is Old King Cole and Van Zandt as the Magician Murgatroyd has designs on his daughter, the princess Alicia (Virginia Hunter). The blacksmith shop is reused in a funny bit that results in Shemp being fitted for horseshoes. The endings of this as well as the last couple shorts is fairly weak. 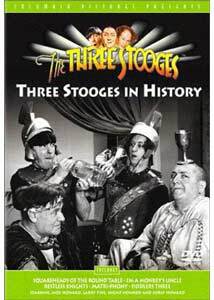 Since the Stooges act out a variety of nursery rhymes, and it's not terribly violent, this short would make a good introduction for corrupting the youth of America with the Stooges experience. A single eyepoke, five blows to the head and four slaps (all in the second half of the short) are supplemented by seven gratuitous pies to the face. This disc makes for a decent sampler of the Stooges' dalliances with history, while the variances in time period help keep it from becoming monotonous. Image Transfer Review: Either Columbia has finally started doing restoration work on its shorts, or these five have been kept in noticeably better condition than those in other volumes in the series. Other than mild speckling that is not frequent enough to be distracting, they look very nice indeed. Greyscales are very broad, with plenty of detail and texture in all of the shorts. The grain tends to be a little sparkly on occasion, but it's also not as bad as in other volumes in the series. Audio Transfer Review: The audio has a bit of hiss and noise present, which is not startling at all for cheap shorts that are 60-70 years of age. But it's quite tolerable and dialogue is clear throughout. The foley effects such as the conks to the head and face slaps have a sharp presence that almost makes the viewer jump at times. Music is as usual tinny and thin but that's clearly a problem with the source material and not much could be done without phonying up the audio to an unacceptable extent. Extras Review: As typical, there are no extras, not even chapters other than a menu entry for each short, nor a 'Play All' button. A good sampler of Stooges in history, with the prints in very nice condition for a change. Still no extras, though.